I guess the Packers aren’t the elite team we thought they were. Where is our defense? This is embarrassing. You need a little more resolve. Vic, is it the play calling or the players? Both look flat in the first quarter. It’s about not winning the one-on-ones. The Broncos are winning them. The defense is getting burned on short passes. What adjustment would you make as a coach? Short passes? I don’t see it that way. This is not the dink-and-dunk game plan fans and media expected. Are we trying too hard to take what we want? Aaron Rodgers needs open targets. The Broncos secondary is No. 1 in the league, and now we know why. They cover tightly. I’m at the game, Vic. It’s loud. I’m a little scared. Also, we don’t look that good. It’s loud and Broncos fans are stamping their feet. The press box isn’t shaking, as it did in Old Mile High, but it’s vibrating. We might’ve overrated the green and gold invasion. I’m all for using it. I’m for anything that’ll work. Packers won the toss and elected to defer. I know you are a fan of getting the ball first in the second half, but this is not typical Mike McCarthy. Thoughts? He wanted a stop and the ball, and that’s exactly what he got. Strategy isn’t the problem tonight. 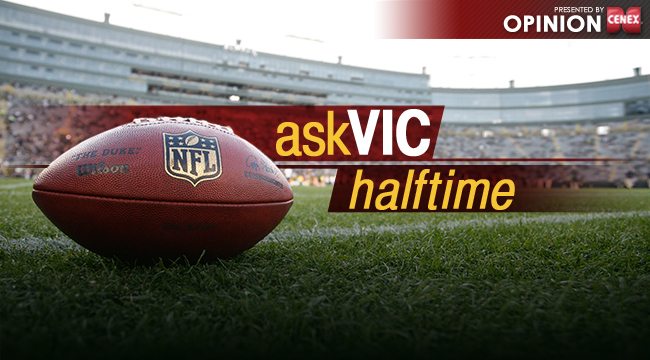 Well,Vic, it looks like the Broncos are taking your advice. Run to slow the blitz, and throw it deep. They don’t need dink and dunk if they are making plays like this. I don’t remember providing that advice. What I recall was everyone expecting the Packers to cover tight on the short stuff and force Manning to throw the ball deep. So much for that strategy. I like burn the boats. Vic, why have we abandoned the run when Lacy started off strong? It was only one play. The Packers began establishing the run late in the first half. Vic, is it just me or do the Packers look scared and hesitant, borderline slow compared to the Broncos? I don’t see scared or hesitant. I see a Broncos defense with Seahawks-like speed. To this point, I haven’t seen them miss a tackle. The Broncos I’m watching in the first half tonight are the best team I’ve seen this year. That can change in the second half. Let’s be patient. Vic, this is hard to watch. I know Denver’s D is good, but this good? No. 1 overall, No. 4 against the run, No. 1 against the pass, leading the league in sacks, four returns for touchdowns. What part of that says not this good?